Cabarita Lookout’s cook, Sharon, will be preparing your meals to your specifications. If you prefer to cook for yourself or select some meals for Sharon to prepare and some yourself, just tell Sharon and she will oblige. 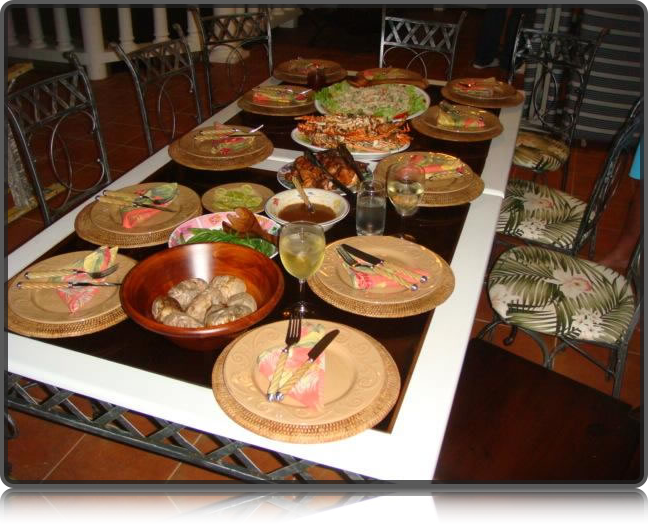 We would like to give you some ideas for breakfasts and dinners as guidelines, but Sharon is willing to prepare whatever is seasonally available to cook.We hope you enjoy the fabulous fresh fruits and vegetables, the fresh fish from the sea and some of our Jamaican favorites like festival and Johnny cakes. Here are a few ideas ... we welcome your creative suggestions! All breakfasts will be served with fresh-squeezed orange juice, a fresh fruit plate and the world famous Jamaican Blue Mountain Coffee (unless you specify otherwise). Here are some breakfast choices: scrambled eggs (ask Sharon about her “Rasta Eggs” with tomatoes, green pepper, onions and Scotch Bonnet), callaloo (a vegetable similar to spinach that is often served with eggs), fresh sliced tomatoes, johnny cakes, cinnamon French toast, banana pecan pancakes, bacon, bagels and cream cheese, muffins, cold cereal with milk and oatmeal. Cabarita Lookout doesn’t provide a lunch menu. If you would like luncheon foods at the villa just have Sharon add it to her shopping list. Most guests like to prepare their own lunches, but If you would like Sharon to prepare your lunch, just ask. I’m sure she’ll oblige. For those of you who like to barbeque, we have a gas grill on the veranda. You may choose to barbeque yourself or have Cutty barbeque. Fresh fish is most often available from the local fishermen along with lobster when it is in season. You may enjoy the experience of joining Cutty in selecting the fish or have it picked up for you. Fresh vegetables and fruits abound at the market. The big market days are Friday and Saturday so take this opportunity to shop with Sharon or on your own. Don’t forget your camera. Here are a few ideas for your dinner menus: fresh grilled Mahi Mahi, fresh grilled lobster, chicken and vegetable stir fry, fried chicken, rice and beans, brown stew chicken, spaghetti marinara or bolognese, barbequed chicken, fresh Tuna steaks, shrimp or chicken kebobs, curried chicken or curried goat. Fresh vegetable selections include: pumpkin (similar to our squash), sweet potatoes, Irish potatoes, callaloo, green beans, cho cho, bok choy, carrots, grilled tomatoes, broccoli, cauliflower, cabbage and pumpkin rice. Fresh salads are available with every dinner. Festival (a Jamaican fry bread that is delicious with honey, cornbread, Jamaican coco bread and whole wheat hard dough bread are available with dinners. Sharon makes wonderful Jamaican desserts. A few of our guests’ favorites include: Jamaican bread pudding with a dark rum sauce (amazing! ), fresh pineapple upside down cake, homemade fresh fruit sorbets, brownies, coconut cake, chocolate cupcakes, fresh fruit and cheese, Rice Cabarita (a rice pudding with dark rum sauce). These meal ideas are only suggestions. Feel free to design your own menu but keep in mind that not all foods available in the States are available in Jamaica. The foods at the local markets are reasonable, the food in the supermarkets tends to be a bit more expensive. We suggest you enjoy the locally grown produce ... pineapple, bananas, papayas, mangos, oranges .. and locally caught fresh fish ... Mahi Mahi, Tuna, Kingfish, Red Snapper and Lobster. Enjoy!